I’m weary of snarling contenders, jostling for attention and hurling epithets as the gentle one quietly slips off the stage. I had hoped Ben Carson might add a final political chapter to Malcolm Gladwell’s DAVID AND GOLIATH, Underdogs, Misfits, and the Art of Battling Giants. If you haven’t read it, the shepherd boy, the future King David, is the first and title example setting the tone for the rest of the compelling stories Malcolm Gladwell uses to make his case. David was an unlikely hero—unless you understand the strengths of the underdog and the weaknesses of the giant. He knows his strength. Watch him approach his enemy with faith in his God and confidence in his skills. He lacked battlefield experience, but he had developed deadly skill with a simple weapon, a sling—an outstanding long-distance weapon, by the way. “Come to me,” the giant calls, out of necessity. Goliath could only defeat his opponent in hand-to-hand combat. 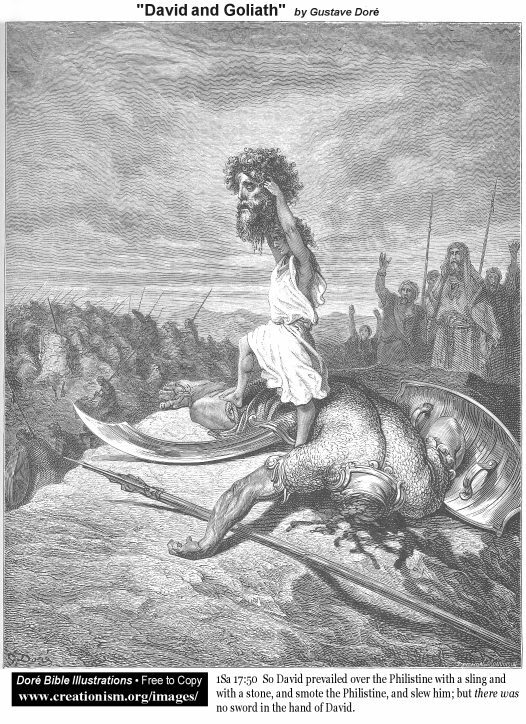 More than that, Goliath may have had blurry double vision. He asks, “Am I a dog that you should come to me with sticks?” David would have had but one staff, but he giant saw two. In contrast, David had clear vision physically and morally. He was a courageous defender of the defenseless. He had already defeated a lion and a bear that threatened his sheep. The army of King Saul must have reminded him of his flock as they cowered in fear before Goliath. Eschewing the needless weight of armor that could only slow him down, David saw what needed to be done and did it. He broke the rules and saved the day. King Saul and all the warriors of Israel knew with certainty that their weapons and armor could not prevail against the long reach of that Philistine hulk—just as most Americans know that the ways of Washington-as-usual are not capable of toppling the Goliaths threatening our country. They want an outsider, a giant-slaying David with a new set of skills. Dr. Ben Carson has been a successful warrior throughout his lifetime, swinging his sling, knocking out giants repeatedly and effectively since fifth grade. He doesn’t do political-speak very well, and I have to admit he has that drowsy way of presenting himself on the debate stage or during interviews. But he is a proven problem solver. As a surgeon, he had to consult experts in other specialties, gather all the available information, and execute a plan based on the facts. He is calm and clear-headed in crisis, and he is an expert at triage: if our country were bleeding over a terrorist attack, the Doc would be on call, quickly at the scene to staunch the blood flow and comfort the families. Unfortunately, the media and the moderators of the debates seemed only able to understand traditional warfare, newer versions of the same old bronze sword wielding they have seen before. They didn’t give the kid with the sling a second look. Is it any wonder that I enjoy losing myself in the Stones of Gilgal world where a quiet hero like Othniel wins a glorious victory over a whole city of giants? Years later when his nation has lost its way, Othniel comes out of “retirement,” brings them back from the brink of self-destruction, and leads them to a startling military victory over a powerful enemy. Not only that but he ushers in a forty year period of peace. (Sigh) Join me in that far more pleasant world. Sign up for “Announcements and Extras” at www.stonesofgilgal.com to get your $3 discount coupon code and then order your copy of Balaam’s Curse the first book in the series at https://mountainviewpress.com/shop/product/99148.